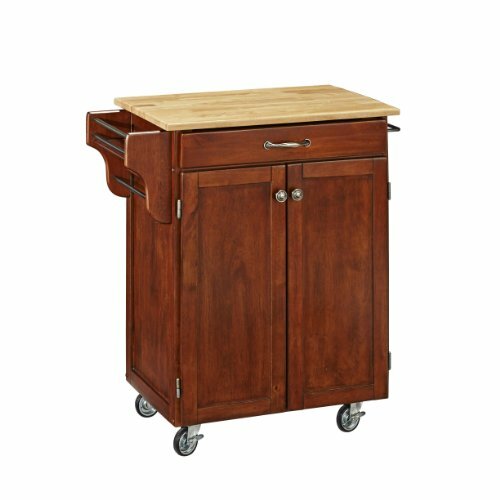 This home styles 9001 series cuisine kitchen cart is constructed of solid wood, natural Asian hardwood in a cherry finish with wood top and utility drawer. This cart having a two door cabinet with an adjustable shelf within, a utility drawer on metal drawer slides, two towel racks and heavy duty casters for easy mobility and safety. This is a unique and refreshing solution for kitchen utility. It consists of sustainable hardwood with a clear coat finish helping to protect against wear from normal use. Available in 32-1/2-inch size. Measures 32-1/2-inch width by 18-3/4-inch depth by 35-1/2-inch height.